The London Knights are having another great season! But this Saturday, the team is going to relax for a few hours to spend some time with the fans that give them such a boost at every home game! That’s right! 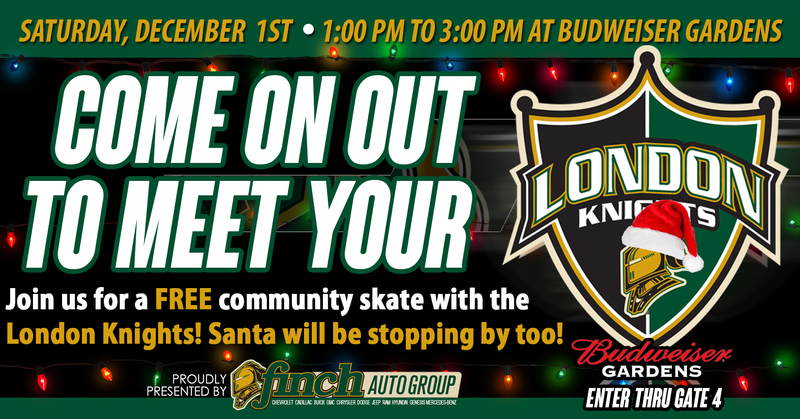 THIS SATURDAY, DECEMBER 1ST FROM 1:00PM TO 3:00PM at BUDWEISER GARDENS, you and all the fans in your family will be able to come out to SKATE WITH THE KNIGHTS! We invite you to join us at this FREE community skate! Attendees are welcome to bring their skates and hit the ice with members of the Knights while the team will also be available for photos, and autographs & Santa will be dropping by for pictures as well! If there are any Knights fans in your family, YOU WON’T WANT TO MISS SATURDAY’S EVENT! If you plan on attending, please enter Bud Gardens through Gate 4. We can’t wait to see you there!